On to part two of last Christmas's decorations! Every year the ceiling is hung with vintage paper garlands and vintage paper lanterns and honey comb decorations, it isn't Christmas without them. Here is a view of the buffet in all of its finery. This feather tree I made over twenty years ago; it is hung mainly with celluloid items. I cheat, not all are Christmas decorations, some are fairground prizes, some are tape measures, and some are party horns. The secret is out! There are two blown eggs hanging on the tree that I traded some tinfoil covered newspaper icicles that I made in grade five. It really is quite amazing that they are still around. The garland is finely cut cellophane and metallic tinsel. It is quite beautiful and quite tattered in spots. 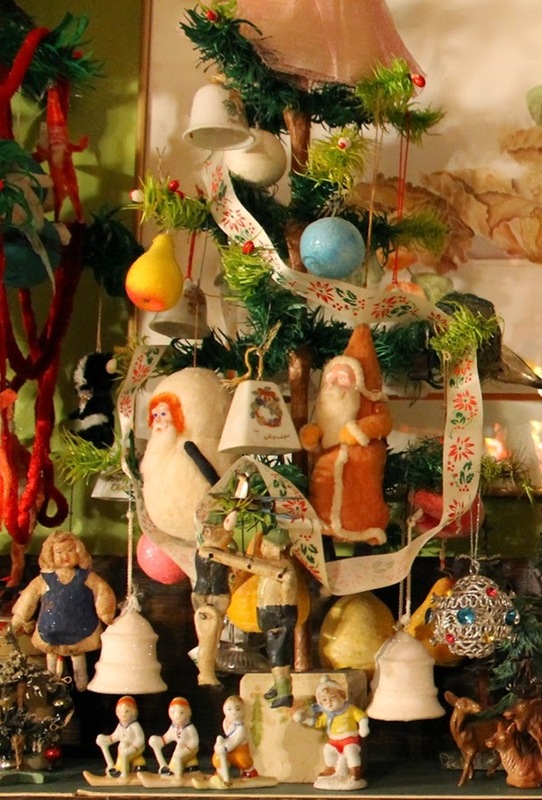 The twin to the other feather tree that I made years ago is covered with chenille ornaments and my collection of cotton batting birds with thread wrapped wire legs and feet. I have not seen any of these older cotton birds for about fifteen years and last December found a bag of birds at Salvation Army. There were six of the birds that I collect in the bag along with some more recent birds that I gave back to them to resell. This is the best picture of the two foot high goose feather tree that I have. Unfortunately all that is visible of the little hard plastic Christmas angel is her pink tarletan skirt. 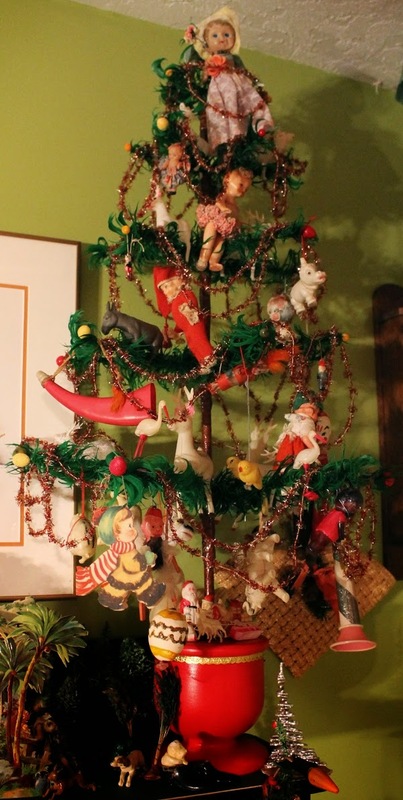 This tree is decorated with the rest of my cotton batting decorations, ceramic Hudsons Bay Department store bells, an early metal sphere, my Victorian dancing couple, she needs a crepe-papier dress, and a 1940s(?) satin ribbon printed with pointsettas and holly. The Hudsons Bay came out with a new wish bell every Christmas in the 1950s. 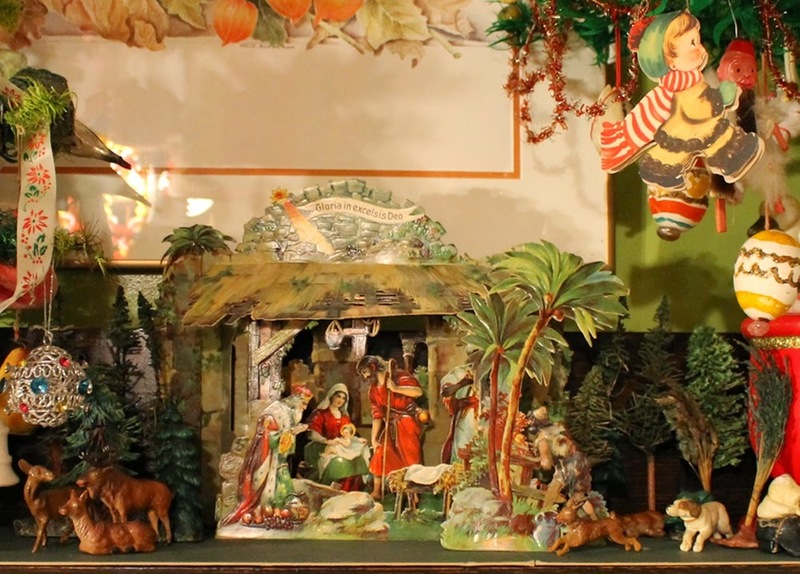 This pressed cardboard manger takes pride of place on the buffet every year, although there is so much to look at I don't know if anyone sees it! I have no idea how old it is but I think my mum bought it in the 40s. There are also six small putz animals and trees, some homemade on either side of the manger scene. Every year we would decorate the main part of the buffet with a Christmas village. Last year I purchased three velvet carpets with an image of polar bears in the snow and decided to do a more simple scene showing off the carpet. The forest of bottle brush trees was put in place and three small houses were put out along with a polar bear planter with Northern Lights designs on his fur and a penguin liquor bottle. This corner was quite dark so I added the string of mini-lights. The feather tree is pre-wired with a set of eight lights. I decorated it with some early mini Christmas crackers, a card of red and silver parcel string, and a 1940s (?) red satin ribbon. 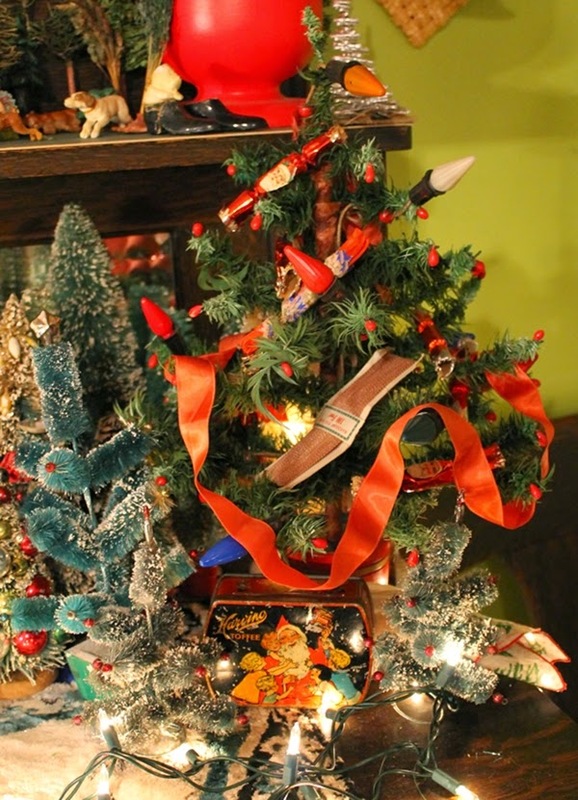 Underneath the tree is a vintage English toffee tin and a vintage Christmas hanky.